We are all working hard, hence the silence on the blog. Always appreciate the kind words in the replies, so I wanted to at least add a quick new wallpaper to say thanks. Hope you like it! A good computer with controller will work for me, but if I were to buy a PS4, yeah same here. Heck, it’s the sole reason I bought a PS4 almost a year ago! HA! Same here! So excited for the game! Just know that we bought game systems just to play your game, we are such big fans! Beautiful and intriguing screenshot. Wonderful work! Woo, wallpaper! Thanks for the update and all the hard work, the game is going to be awesome. I remember reading quite some time ago that there was going to be this puzzle where as you solve this series of panels that the world actually changes and shifts around you on each one behind you (so you don’t notice it until you go backwards before the ones you originally solved) and that the last puzzle in the series is sort of parallel to the shifting world. That sounds pretty ingenious and exciting. This wallpaper reminded of that when I looked at that block on top of this corridor along with those sort of rails up top. Anyhow, thanks for the wallpaper post and congrats on all progress your team is no doubt hammering down. Keep up the amazing work, and I’m sure it’ll be worth it! I check the blog for updates every day like Will Smith out on the pier in I Am Legend checking for signs of life. It’s remarkable how satisfying movement in the distance can be. 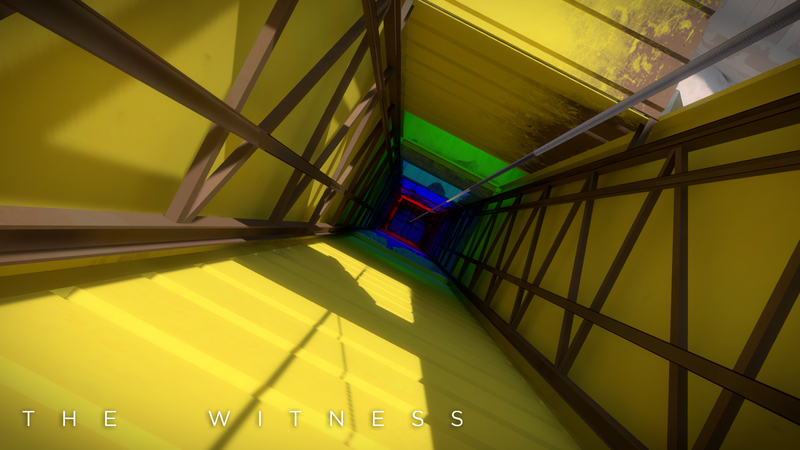 Will folks get another glimpse at The Witness at The PlayStation Experience show in December? I won’t be there, but will be reading about coverage and may catch a livestream (if there are any). Thanks for the update! I’m really looking forward to this! I expect Sony are keen to have this one out some time over the holiday period, but I hope independence is allowing you to avoid a ‘crunch’ period. And of course have less patches than the average game today from a major publisher. There are a LOT of young, middle and older gamers that love exploring and puzzles. We also adore strange places. I was gaming back when we had to make our own games with stick figures. We died and went to heaven when leisure suit Larry came along. We stayed there with the Myst series and totally lost reality with Uru. Well, it has been entirely too long with all of these FPS and most of the mmorpg worlds. There are millions of us out here with disposable funds awaiting for the next popular format in gaming. We assume and hope it is with the Witness. Just the thought of a serious exploration game is creating a good deal of happiness in the world. I recently got Fract:OSC on sale at GOG, and it is a great exploration game. Don’t let the music stuff scare you; you don’t need music knowledge to solve the puzzles or enjoy the music and exploration. It captures the feeling of being in an alien (meaning different) environment extremely well and tricks you into successfully composing music. Also if you’re cool with 2D, Toki Tori 2+ is a must play. Very satisfying exploration and puzzles. I absolutely love puzzle games (I can’t even tell you how many hours I’ve spent combing through user content in Portal 2) and I’ve been itching to get my hands on this since I saw it during the ps4 launch. While I wish it would have had an earlier release date, I completely respect all the hard work you guys are putting into the game to make sure its the very best it can be. On an unrelated topic I have a question if you have time to answer. I’m currently working on my bachelors degree in Recording Arts at Full Sail University with the hopes to someday become an Audio Mixing Engineer that works on video game audio. Any suggestions on the best way to get started in that area? All the art from The Witness looks amazing! Keep up the good work, we are rooting for you! Man I wish I was coding something interesting like this instead of mind-numbingly tedious financial business applications! My brother-in-law, sister-in-law and myself are all DYING to give you our money for this game. We can’t wait! The more I see art of The Witness the more admirable I find your work. You’re getting only better and better. Don’t hurry, just keep on completing the game in the way you like it, and it will be amazing! well, now i see. This is the tube you are falling through in the trailer. In the trailer you’ll see a room with all kinds of green plants and i see the same glowing thing in the middle of this screen. once more: keep up the good work and take your time for completing the game to your wishes. A webshop in the Netherlands (bol.com) confirmed to me that they would be able to send me the witness on 31-12-2014. They list the studio making the game as “Mumbo Jumbo”. Thats how you know its legit! Unless they are talking about the movie called “Witness” which stars Harrison Ford. Im sure they can send that to you by year end on VHS. It will be amazing, cant wait to get it. Just take your time and make it perfect, we will wait! Hope the game is really good and successful, whenever it comes out. Might one suggest using an 8-direction 1px text-shadow to outline the title and site-description text in a slightly darker color? #aaa gives it a nice contrast to #fff without being too overwhelming, and makes the text stand out a lot better against the colorful island background. And, maybe up the font size on the site-description text to 1.6rem or 1.8rem? Or, if you’re going for that lost-in-the-clouds feeling, I guess that’s cool too. Love the new site design. Didn’t know where else to tell you. Ah, glad to hear it! Spent all day fighting with WordPress to get something better. Should improve considerably tomorrow. New site looks great even though my header at the top gets cut off on the left side. Could this site change be a precursor to a release date announcement? For such a beautiful game we wouldn’t want everyone flocking to an aesthetically unfinished webpage. Should be working fine now! Yup it’s working great now, thanks! That’s not a very long list, which just goes to show how much I’m looking forward to this. Love the new site changes!!! It almost had me giddy thinking that something is happening soon with news of the release of the game. Keep up the great work guys! Oh .. I never thought of that till now. Experiencing a stormy night, with thunderclaps on this island, with all its surreal beauty. Now that’s going to be capital. I hope that kind of weather is present in the game. New website looks great! Have a great time at the Playstation event this weekend! I most probably won’t be watching footage to stay spoiler free! Since you say you enjoy the comments, I thought I’d post some words of encouragement. I’ve been keeping track of this game ever since it got announced, as I’m convinced Jon is a genius from Braid and his various lectures I’ve seen bits of. The prospect of a puzzle game that is so integrated into its environment is something I really love, as I adore Portal and WANT to love older puzzle games like Myst (but they’re a bit static and lack feedback that modern video games are generally so good at providing). You all look like you’re putting everything into this, the attention to detail is really shining through in the screenshots, and I’m sure it’s even more apparent when you play the build. I can’t stress how much I love that. Game worlds where you can tell the designers paid a ton of attention to the environment, where you are rewarded simply by looking around you, they feel SO much richer than other games where surroundings are purely a vehicle for some standard gameplay. So while I say I’m impatiently waiting, I’m pretty damn confident any extra time you make me wait is gonna be worth it. Thanks for the updates guys! Hey look! A gameplay demonstration of the Witness at PSX. Cant’t wait for this game! It’s gonna be so amazing!